Tristan Thompson is the only one-and-done player in this class, and while he doesn't stand out overall, his ability to get to the line is an incredibly valuable skill. No player in this group of big men got to the line at a higher rate than Thompson. More than a quarter (26.3%) of his possessions resulted in a free throw, which is a pretty staggering number. Thompson only scored 0.938 PPP overall (4th last), and there's no question that his skill level has a long way to go, but he has plenty of time to improve and his ability to get his team into the bonus despite being so raw is promising. Thompson's biggest weaknesses from a situational standpoint are his post-game and jump shooting. With nearly 37% of his touches coming down low, the Canadian big man only scored 0.749 points per-possessions with his back to the basket, 2nd to last in this group after Jeremy Tyler. As a jump shooter, Thompson scored a sample worst 0.654 PPP on a meager 0.7 attempts per-game, which is not much of a surprise considering his 49% free throw conversion rate. The 20-year old big man lacks significant polish at this point. At this juncture, Thompson's ability to put the ball on the deck and throw his weight around down low are notable, but he's only an average finisher (64%) and has a ton of room to grow into a role in the future as his skill set begins to dictate what he can bring to a team offensively. Measuring in slightly taller than expected 6-7.5, Tristan Thompson has average size but compensates with a 7-1 ¼ inch wingspan. Those measurements put his in the company of Josh Smith (6-7 without shoes, 7-0 wingspan) and James Johnson (6-7 without shoes, 7-0 ¾ wingspan) amongst recently drafted players. Amongst the younger players here, Thompson's 227-pound frame is also impressive. Tristan Thompson was the 12th ranked member in the class of 2012 and, like many of his fellow top-ranked freshman, struggled with inconsistency this season while showing tantalizing flashes of potential. While he registered 10 double-doubles and emerged as one of the top big men in the Big 12, he struggled offensively in high profile match-ups against North Carolina, Southern California, Kansas, and Arizona, all teams with NBA-caliber frontcourt players. Despite his up-and-down freshman campaign, however, Thompson entered the 2011 NBA Draft and hired an agent. While he is currently projected as a lottery pick questions remain, however, as to what Thompson's role will be in the NBA and whether his skill set translates favorably to the next level. From a positional standpoint, Thompson projects as a power forward. While he may lack ideal size at around 6'8, he compensates with a long 7'2 wingspan and a solid 235-pound frame. He must continue to get stronger, but he already has a strong lower body and core, which allowed him to hold his own in the post despite his low skill level as a freshman and should continue to work in his favor at the next level. Thompson is a good overall athlete, adequately quick and explosive, bouncy and active around the basket. Even if he is not an elite athlete by NBA standards, his freshman season was characterized by his energy and while he is not particularly skilled, he asserted himself simply through his consistently high effort level. Fittingly, Thompson found nearly half of his offensive possessions by making athletic plays off of the ball: scrapping for offensive rebounds, cutting to the basket, and in transition, where was an excellent finisher. His ability to move without the ball, in particular, is promising to his early NBA prospects, as he will not likely have many plays run for him until he develops further. He is most effective cutting to the basket and finishing off of dump passes and lobs at this point. Texas rarely utilized him in the pick-and-roll, but he looked very solid in limited possessions where he showcased his quickness and mobilitysomething that could become a staple of his game in the NBA. He also does a good job of crashing the offensive glass, averaging 4.9 offensive rebounds per 40 minutes pace adjusted, which ranked eighth amongst prospects in the DraftExpress Database this season. His quick second bounce and active hands allow him to remain a factor for most loose balls in his immediate vicinity, a skill that should translate favorably to the next level. While he is productive as a scorer off of the ball and will likely improve with a more experienced point guard, he is less successful when he is expected to create with the ball in his hands. According to Synergy, he receives nearly 38% of his touches in the post, but he finishes at a below average rate. This inefficiency is curious for a post player with a 54.6% FG and a reputation for playing with energy, but his lack of skill is abundantly clear on video. His footwork and instincts are both raw and he largely succeeds at this point by powering the ball to the basket and out-hustling his man. He has very few post moves that take him towards the basket and very little resembling a countermove. He is adept at quickly turning the corner, but little else, if he cannot initially beat his man for an athletic finishsomething that will likely be more difficult in the NBA considered his average size and strength. Most of his moves dissolve into an array of contested fall-away shots and jump hooks, low percentage shots that he does not appear to have the touch to consistently knock down. He resorts to this offense against bigger and more athletic post players, in particular, which suggests he may similarly struggle if he cannot further develop his post game at the next level. He must also work on recognizing and passing out of double teams. Though he seemed to improve towards the conclusion of his freshman season and considering his low turnover rate relative to power forward prospects in DraftExpress's database, he still turned the ball over on 14.8% of his possessions in the post. He must get more adept at moving the ball out of the post as an NBA player, at least until his skill level improves dramatically. Intriguing, however, is Thompson's burgeoning face-up game. While he is by no means consistent, he looked more comfortable as the season wore on at facing his man up and taking one or two dribbles into a move around the basket. He also showed very occasional flashes of being able to pull up and shoot off of the dribble. He hardly excels consistently in this area yet, as he particularly struggles in isolation sets, but he certainly shows potential to develop. As he lacks ideal size and strength in the post, he would be well suited to improve both his face-up and mid-range games, where he could better utilize his athleticism to his advantage. Another area in which Thompson must improve significantly is his shooting. Most slightly undersized power forwards in the NBA are reliable spot-up shooters, but at this point, Thompson is miserable at best. He attempted only a handful of shots at Texas and the results were mixed, marked by inconsistent shooting mechanics that must be completely overhauled at the next level. Furthermore, though he attempts an outstanding 9.3 free throws per 40 minutes pace adjusted, he converts on a horrendous 48.7% of his attempts. He ranks amongst the top five power forwards in our database at getting to the line, yet finishes at a bottom-five-rate, a discrepancy that he must improve upon significantly as he prepares for the next level. While his offensive game is a mixed-bag at best, Thompson actually projects quite favorably as a defender. His performance against future top-3 pick Derrick Williams, in which Williams shot 4/14 from the field in just 29 minutes, is indicative of what Thompson can offer an NBA team. His lateral quickness allows him to stay in front of most collegiate post players, inside and outside, and he may even be able to guard small forwards in the right match-ups at the next level. He capably bodied up bigger and more athletic post players throughout his freshman campaign and should develop into a solid post defender as he gets stronger and learns to curbs his fouling inside. He must improve as a rebounder, however, and his subpar 5.1 defensive rebounds per 40 minutes pace adjusted will not cut it at the next level. His fundamentals are poor thus far, as he largely gets by on his size, athleticism, and good hands, but focusing on positioning is key as he transitions to the next level. Thompson's potential, at this point at least, far outweighs his ability to contribute in the NBA and any team looking to draft him should be patient. It would be ideal for Thompson to develop alongside of a skilled center and a creative point guard, as his energy and athleticism are by far his most attractive attributes at this stage and he will likely struggle to create or produce on his own much initially. It is far more likely, however, that he will begin his career coming off of the bench and that playing time will depend on his energy level and defensive effectiveness. His development could follow any number of trajectories from end-of-bench rotation player to NBA starter, from Carl Landry to Luc Richard Mbah a Moute. His ceiling is arguably higher than both, however, if further develops his post skills and re-tools his jumper. The said, such development is never a given, particularly with raw post players who are two-years older than most of their classmates, as is the case with Thompson. 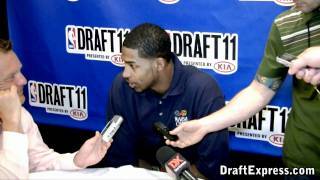 Ultimately, however, it is clear why Tristan Thompson is a likely lottery pick in the 2011 NBA Draft. His size, athleticism, and energetic style of play on both ends of the court should earn him rotation minutes early and his potential is certainly enticing looking to the future. Whether or not he achieves this significant potential is unknown, but even now, there is clearly a niche in the NBA for Tristan Thompson. One of the top freshmen in the country, former McDonald's All-American Tristian Thompson is off to a solid, albeit inconsistent start in Austin. He's put together some great single-game performances, including a 17-point, 15-rebound effort against Michigan State and a 20-point performance against Illinois, but he's struggled at times as well, as evidenced by his 6-point performance against USC and 4-point, foul plagued outing against North Carolina. An intriguing prospect with some impressive physical tools, Thompson has made his strengths and weaknesses abundantly clear early in his freshman season, supporting many of our observations from his high school career in the process. Standing just 6'8, Thompson is a bit undersized for a power forward on the NBA level, but compensates with a tremendous 7'2 wingspan. Sporting a solid frame that looks as though it could handle quite a bit of additional muscle, the Ontario native has the athleticism to play either forward spot at the next level, but is relegated to the power forward position by his lack of perimeter skills. Taking that into consideration, it will be important for Thompson to maximize his physique by continuing to work hard in the weight room. Thompson's athleticism plays a key role in his draft projections at this point because his skill set is still growing into his body. He does a few things very well on the offensive end, all of which revolve around the imposing quickness, length, and leaping ability he possesses for his position on the college level. First, he gets to the line at a high rate, ranking 7th in our database in FTA/FGA at 0.89 per-attempt, an incredibly impressive accomplishment for a player who lacks a polished post repertoire and great ball-handling prowess. Second, he ranks as one of the top per-40 minute pace adjusted rebounders amongst prospects in the college game. Finally, Thompson is also a very good finisher, efficiently scoring tip in opportunities, fast break feeds, and simple catch and finish opportunities. Apart from his ability to finish, draw contact, and crash the glass, Thompson is limited by his skill-level at this point. His awkward jump shooting mechanics make him a non-factor away from the rim and renders him as a highly questionable free throw shooter (48%) and midrange scoring threat. He's capable of making quick, decisive straight-line drives to the rim by exploiting his long strides and nice first step, but needs to become a steadier ball-handler with both hands and a better decision-maker to maximize his potential as a face-up threat. With some 40% of his possessions coming in the post according to Synergy Sports Technology, Thompson doesn't have a true go-to-move, and is still a work in progress as a NBA caliber shot creator. Defensively, there is a lot to like about Thompson at this point. Maligned for his effort level at times early in his career, the Findlay Prep product is a consistently active defender at this point in his career who can adjust shots around the rim and make an impact in the passing lanes out on the perimeter. A versatile defender on the NCAA level, Thompson's blend of length, strength, and lateral quickness allow him to defend both forward positions effectively. He doesn't change directions extremely well at this point, losing his man on double-moves on occasion, but he does deny penetration well and with additional coaching, he could match his ability to pull down rebounds at a high rate with the ability to defend the inside and outside alike. A year older than some of the other prospects in the freshman class, Thompson is a raw offensive player whose physical profile allows him to make an impact on both ends of the floor. If he adds a consistent midrange shot, go-to post move, and refined handle to his repertoire, he could sky-rocket up draft boards. In the meantime, teams may wonder where his scoring production will come from in the NBA. Thompson is already an intriguing prospect, but he has a great deal of untapped potential, making him a player to keep an eye on as the Longhorns move through their Big 12 schedule. This surely wasn't the most impressive performance of the season for Thompson (#6 Scout, #17 Rivals, #11 ESPN), partially due to foul trouble, so it's probably not wise to read too much into it and instead wait for better opportunities to evaluate him. What we could see was that Thompson has shed most of the baby fat he was surprisingly sporting last summer and has worked on chiseling up his outstanding frame. He's still the same long and athletic forward with outstanding rebounding skillscoming up with some monster boards out of his area in traffic in this game, and being pretty active in general getting his hands on loose balls. Offensively, Thompson continues to look fairly limited, as he doesn't sport much in the ways of ball-handling skills or perimeter shooting ability, and didn't make much of an effort to assert himself in the post considering the size advantage he enjoyed on his matchups. He did have one terrific drop-step move, which was unfortunately called off due to a dubious traveling violation. Ultimately he remains the type of player who needs shots created for him around the basket beyond the points he gives you in transition or on the offensive glass. Beyond that, it's better to wait for the high school all-star game circuit to formulate a better opinion on his long-term potential. One of the highest rated players in the 2010 class, Tristan Thompson (#1 Scout, #5 Rivals, #3 ESPN) showed everyone in attendance why, scoring 20 points on 7-for-13 shooting while pulling in 13 rebounds and making 3 blocks. The 6'9 forward has a skinny frame but is very long and is exceptionally quick off the ground for his size. He's also highly mobile and coordinated with good quickness, and clearly is just tapping the surface of his potential. On the offensive end, Thompson does most of his damage in the paint, where he has the groundwork of a post game in place. He has no right hand to speak of at this stage, but he shows flashes of drop-steps and turnaround jumpers that he finishes with good touch and follows up strong when he doesn't. He also will disguise his lack of a right hand by faking a spin left shoulder, showing a decent grasp of counter-moves for someone his age. His moves aren't highly defined yet, but you can see the immense potential in the amount of range he covers on his moves when he makes them, being able to extend for good separation with ease. Thompson doesn't have much of a jumper yet, but he shows flashes of ball-handling abilities, looking uncomfortable in the halfcourt but fairly comfortable in transition where he finished on a nice end-to-end dunk here. Thompson was strong in transition and attacking the glass in this game, using his good hands, long arms, and quickness getting off the floor to finish with ease. Defensively, he shows a fairly good basketball IQ for his age, showing a good understanding of pick-and-roll defense along with the lateral quickness and stance to stick with guards when he switches off on the perimeter. In the lane, he shows pretty good timing and awareness on shot blocks while he's active moving around the floor. He's prone to going through the motions at times, looking lackadaisical on some possessions, but nothing severe. Looking forward, it's easy to understand why Thompson is so highly rated in his class, though he clearly still has much work to do. While his frame is capable of holding a bit more bulk, he doesn't have a prototypical power forward's body with his narrowish shoulders, so developing more perimeter skills to become more of a combo forward should be highly considered, though growing another inch or two wouldn't hurt either. His potential is clearly off the charts, and his combination of physical attributes (length/athleticism), budding skills and seemingly very strong intangibles paint a very bright picture moving forward. Weve written about Tristan Thompson (#1 Scout, #2 Rivals, #5 ESPN) in plenty of depth already (click the link to view his profile and read more), since he played for one of the top high school teams in America this year, alongside Samardo Samuels, and not much has changed since the last time we saw him. Hes still the same super long, athletic physical specimen with a perfect frame for an NBA small forward or modern day hybrid forward. He has the lateral quickness to defend either the 3 or the 4 in the NBA, but doesnt have the skill-set to play on the perimeter offensively at this point in timewhich isnt a shock considering that he just finished his second year of high school. Thompson can finish in traffic, but is just an average ball-handler, while his outside stroke gets pretty shaky once you get past the mid-range area. He looks fairly passive at times (in our words) and was even called soft by others, but its probably way too early to go that far so soon. At this point its pretty clear that Thompson is much more of a prospect than he is a productive player just yet, but there is no doubting the upside he has. Now its time for him to fulfill it. Despite just being a sophomore coming off the bench, there may be no more of an intriguing prospect on St. Benedicts than Tristan Thompson. The sophomore played sparingly and though his performance didnt appear that impressive in the box score, there were several flashes of big time potential. At 68 215 pounds, Thompson has a very long and lean frame. While his lack of muscle at this point hurts him somewhat when playing inside, his wingspan and athleticism more than make up for it. The youngsters release point on his shots in the paint is so high that most players at this level will not be able to block them. On the other side of the ball, Thompson is already a shot blocking menace, recording a couple of very impressive swats during his time on the floor. By far the most intriguing feature of Thompsons game that we saw though was his ability to play on the perimeter. Though he didnt attempt any shots from out here, he looked quite comfortable handling the ball on the wing, and clearly this is a normal part of the St. Benedicts offense to have him out there. Thompson is athletic and quick enough where if as he becomes more of a focal point of his teams offense it isnt hard to imagine him taking advantage of mismatches on the outside and taking slower post players to the basket on a regular basis. Defensively, Thompson shows loads of potential as a disruptive force. As previously mentioned he is already a shot blocking threat and his length makes him a very strong rebounder. If he can add some extra weight to keep from being pushed out of position he will almost certainly be a double-double threat on a nightly basis. Thompson typically plays with his arms up which allows him to cut off passing lanes and deflect a lot of passes. It is certainly too early to make any kinds of predictions about how Thompson will turn out, even as a college level athlete. What is obvious though is the amount of upside and potential for Thompson to develop into an excellent player. He already has good size and has room to grow; factor in his athleticism and his developing play on the perimeter, we could be looking at a 68 player that could blossom into an inside-outside threat.